The Ocean Cleanup: can it pick up the ocean’s plastic? A Dutch inventor and his controversial project have begun cleaning the Great Pacific Garbage Patch. System 001 in San Francisco Bay. Photo Courtesy of the Ocean Cleanup Media Gallery. A new project that made its way into the Pacific Ocean to tackle the growing problem of oceanic plastic pollution has finally arrived at the Pacific Garbage Patch, a massive flotilla of floating debris and plastic. The Ocean Cleanup was founded in 2013 by 24-year-old Dutch inventor Boyan Slat, who wants to solve the issue of plastic pollution in the ocean by attempting to clean up the Great Pacific Garbage Patch, an accumulation of plastic the size of Texas, located between California and Hawaii. Slat has engineered a machine to clean up the garbage patch, known as System 001, that was put into the Pacific Ocean near the Golden Gate Bridge on Sept. 8. The machine essentially acts as a 600 meter coastline in the middle of the ocean, flowing with the ocean's natural currents with a three meter net below to capture plastic. The machine is set up in a unique U-configuration so that plastic can accumulate within it, and then be swept up. 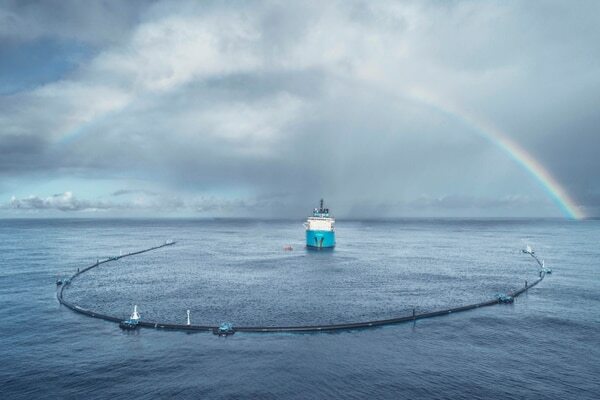 The company's goal is to eliminate half of the Great Pacific Garbage Patch in the next five years, and 90 percent of the ocean's plastic by 2040. 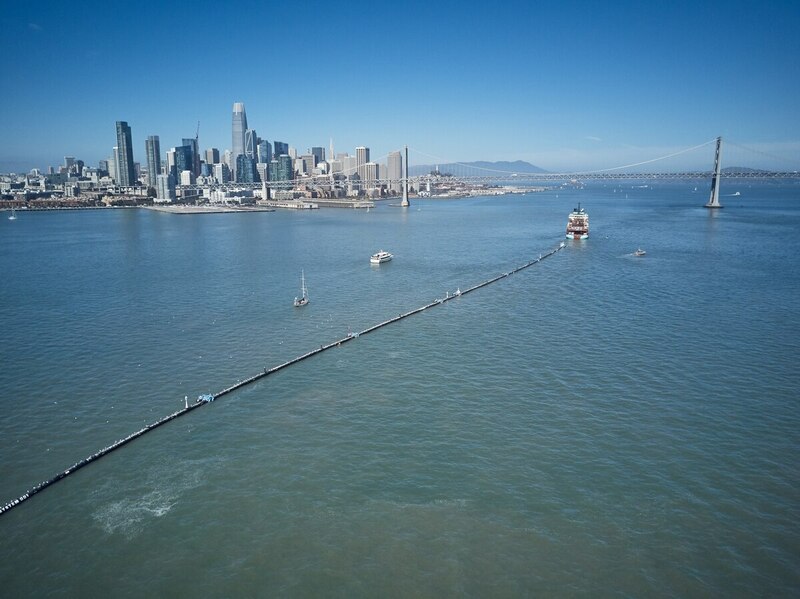 System 001 left the San Francisco Bay and went through a two-week trial period to determine the effectiveness of the machine before gaining clearance to head to the Great Pacific Garbage Patch, according to The Ocean Cleanup's website. If all goes according to plan, other identical systems will soon join it. 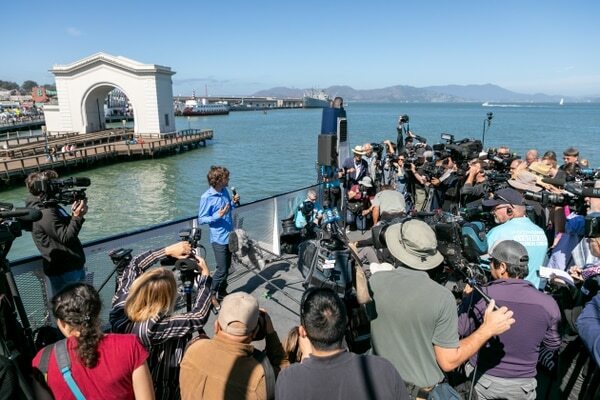 Boyan Slat speaks to reporters in San Francisco on the September launch date. Photo courtesy of the Ocean Cleanup Media. “We are happy to announce that it has reached its intended location and has been deployed into operational configuration; the cleanup has officially begun,” the website announced in its most recent update. The Ocean Cleanup wants to finally solve the problem of this plastic that is already in the ocean, as many have neglected to do, according to Jan van Ewijk, spokesperson for the Ocean Cleanup. The project doesn't claim it can clean up all of the ocean's plastic, which amasses on shores and deep below the reach of System 001's mechanical arms, but the Great Pacific Garbage Patch is their main target. "The Ocean Cleanup's efforts are such a big step because they are the most effective plan to deal with the legacy problem of ocean plastics," van Ewijk said. "Although prevention is certainly a necessary part of the solution, it does not solve the problem of plastics that are already in the oceans. Other plans that have been put forward (e.g., going after the plastics with ships and nets) are very time-consuming, expensive, and/or environmentally unfriendly." Various experts in the field maintain contradicting views regarding the efficacy of the plan to clean up types of plastic in the ocean. For one, they differ on the size of the plastic in the ocean and how it can be cleaned up. Van Ewijk said that "92 percent of plastics are larger than microplastics and can therefore be caught by the system." However, critics are quick to point out that, below the surface, the solution is not as romantic as it seems. Eben Schwartz, Marine Debris Program Manager for the California Coastal Commission –a state agency that focuses on ocean accessibility and preservation – argued the project lacks a fundamental understanding of the extent of the plastic problem, which goes deeper than the three meters of surface water inhabited by Slat's machines. The plastic in the North Pacific Gyre, the ocean gyre that contains the Pacific Garbage Patch that the Ocean Cleanup Project is attempting to clean, makes up barely one percent of the overall plastic in the ocean, according to Marcus Eriksen, founder of the 5 Gyres Organization. Schwartz argues the most effective way to stop the plastic pollution problem is to stop plastic from getting to the ocean in the first place. Talia Walsh, Associate Director of Communications at Heal the Bay (a non-profit organization that focuses on environmental preservation based in Santa Monica) echoed Schwartz's point that this was not going to automatically fix the plastic pollution problem, yet stated it was an important step. "Will this particular project solve all our issues and problems?" Walsh said. "No. Will it remove all the trash in the ocean? No. Will it maybe cause harm? Yes. But we have to start in a scientific way to precede with innovation." Here in Los Angeles, local advocates agree that participating in beach cleanups is the best way for the public to get involved and make a difference. "Even if it's once a month or once a year, I don't care, just try to volunteer because it'a a good way to network and get informed about what's going on on the ground with issues you care about," Walsh said. Schwartz said that at the California Coastal Commission's cleanup on Sept. 15, they cleaned up "in three hours, about seven times what the Ocean Cleanup Project hopes to clean up by next April, and most of that is trash that has never had a chance to enter the oceans in the first place." The California Coastal Commission confirms these numbers, and their data suggests that 80 percent of the trash they collect originated from land. The public and their efforts may be somewhat removed from the project, but as Walsh said the Ocean Cleanup Project is still leading to healthy debate. "The project is really exciting and it's something the science community, but also the public at large, is debating," Walsh said. "I think this debate is good because this is just one project. This is just one idea. I think we need to start looking more at these types of ideas and encourage people to address them." Van Ewijk acknowledges that preventing plastic from reaching the ocean in the first place is important, but she said it does not solve the problem of plastics that are already in the oceans, which this project could do. "Hopefully, the public can expect the first plastic to be brought back to shore in a couple months, which would be the ultimate proof of our concept." van Ewijk said. Correction: A previous version of the article omitted a word from Walsh's first quote. She does not believe the Ocean Cleanup will definitively cause harm.